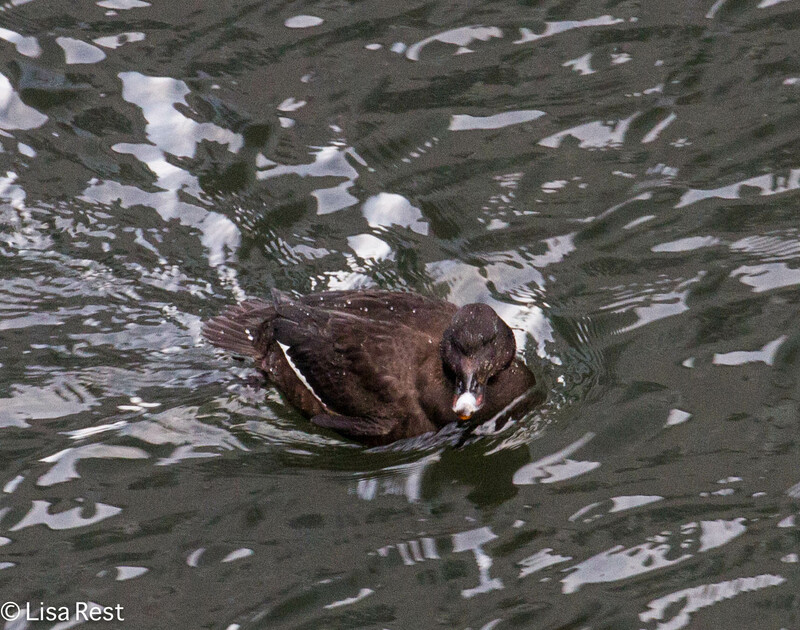 As if in answer to my prayer…the White-Winged Scoters that have been reported everywhere I have not been able to get to (namely the Chicago Lakefront where there is open water instead of ice) finally showed up in the Chicago River this week. Someone reported them at the North Branch but since the Loop is far south of that I didn’t know whether to be encouraged or even more frustrated. 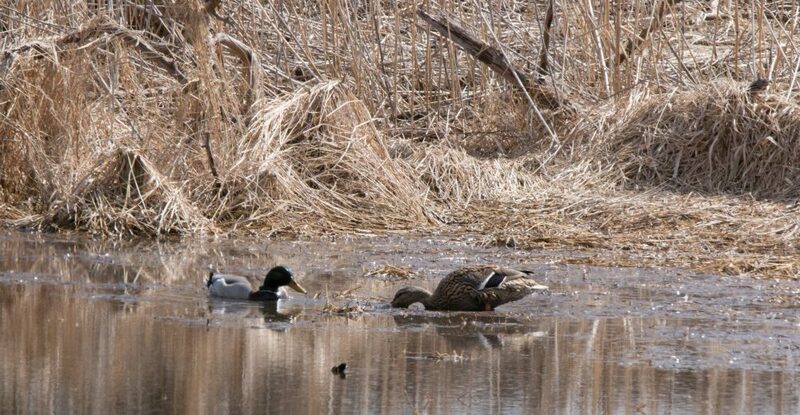 But Wednesday morning I caught my first glimpses of them – they were catching naps all the way over on the other side and at first all I could see were small patches of white on their wings. But they eventually woke up and started diving. Still they were too far away to get decent pictures. Yesterday I packed my better lens, and feeling optimistic (there was actually a little sunshine early in the morning) I attached it before I got out of the train station. 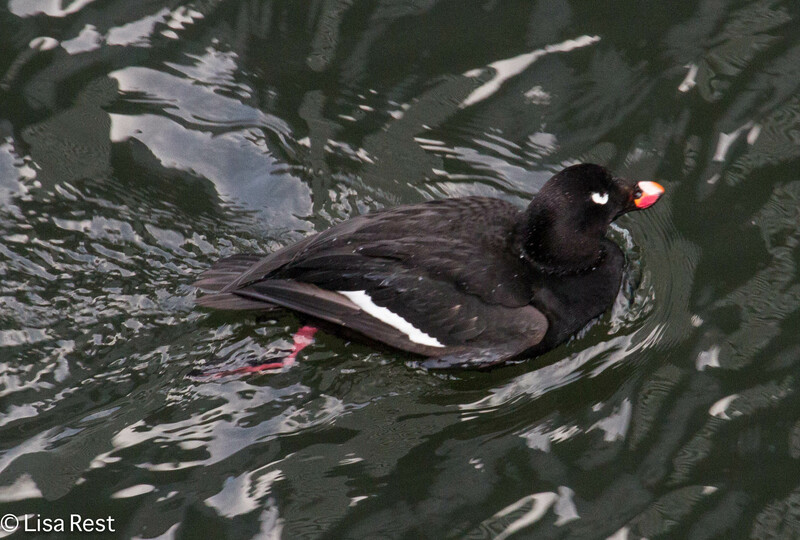 I walked to the railing, looked over the side, and the White-Winged Scoters were there – on my side – as if they had been waiting for me. 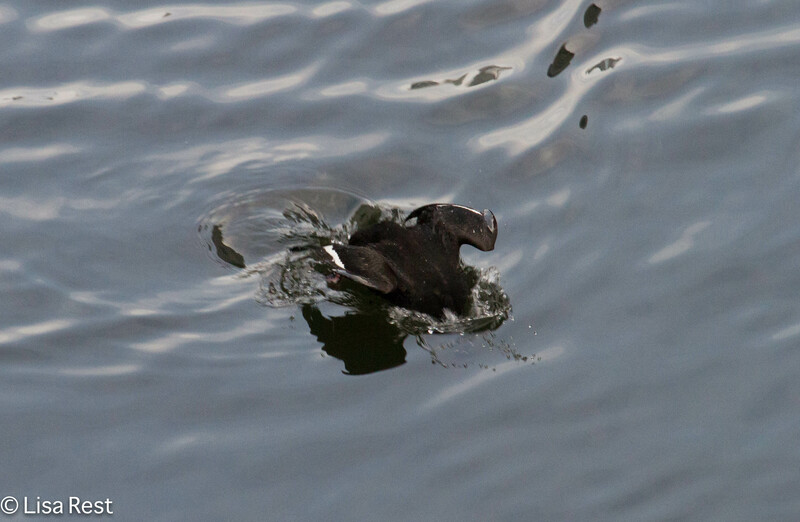 Even though the light was still a problem, the river being almost black, it’s so dark, and the birds being black themselves, I managed to get these few shots from some very cooperative birds. 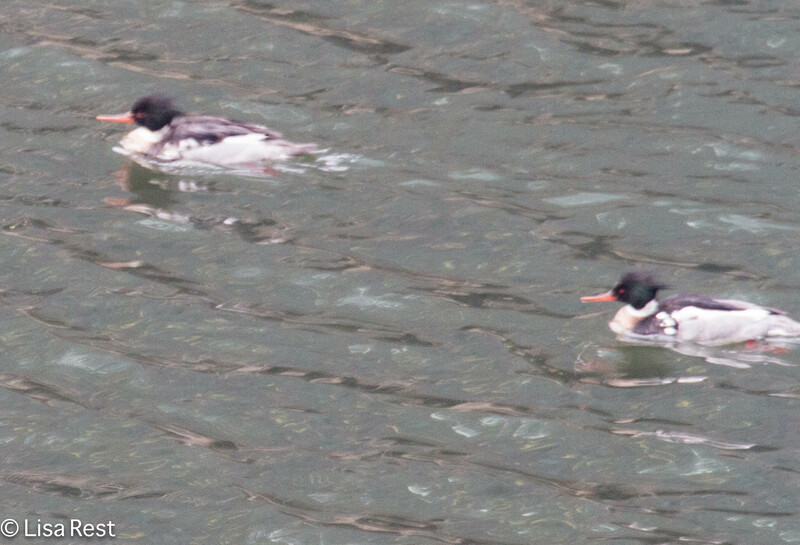 The Red-Breasted Mergansers are still in the river in numbers, too. Sometimes within good view. 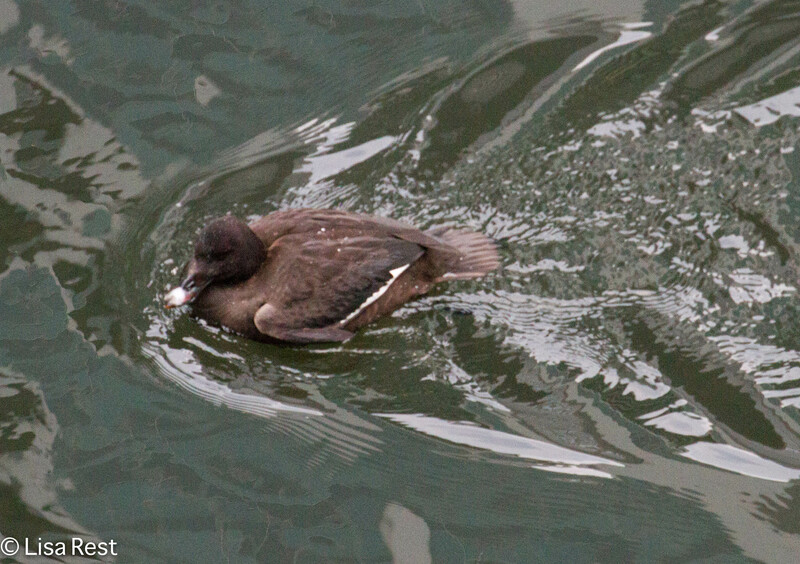 And as it always is with diving ducks, they disappear. 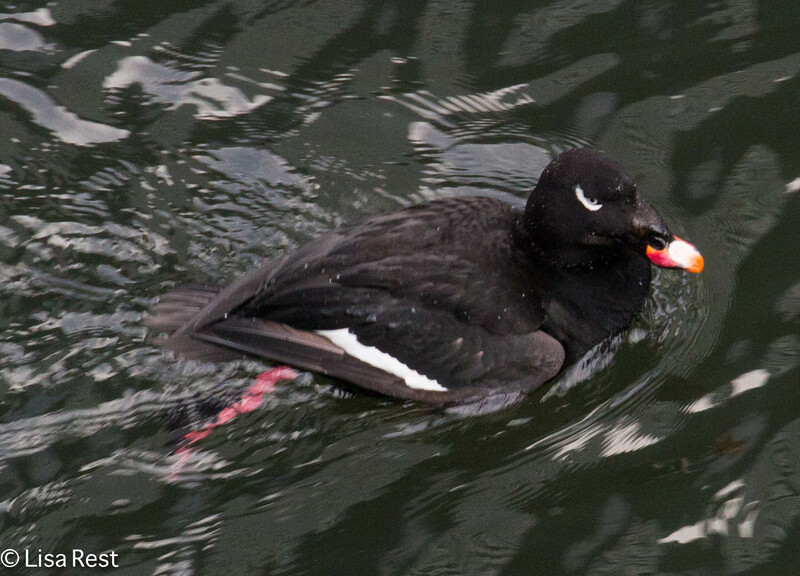 This entry was posted in birds, photography and tagged Chicago lakefront, Chicago Loop, Chicago River, Lake Michigan, North Branch, Red-Breasted Mergansers, White-Winged Scoters by Lisa Rest. Bookmark the permalink. Glad you finally got to see the scoters! Such handsome ducks! Thanks, Sheryl! I never thought they’d come to me…! Thanks, HJ! When it warms up next week I’m going to try the lakefront (finally)! Happy Valentine’s Day too. Sorry I forgot that with your post. I am wearing red, though? 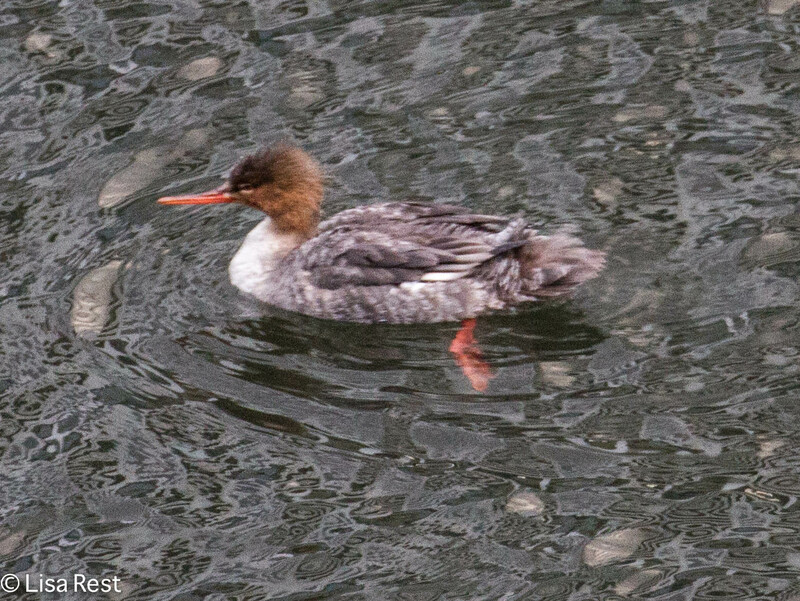 I think that the merganser (we call them goosanders here) are my favourite water birds, particularly the female. I think I’d have to agree with you. They always appear to be engaged, they hang out together, and they have the most interesting coiffures. Thanks, Julie! They really don’t belong here, but the winter has been so brutal they have come south. I just heard on the radio this morning that the Great Lakes are 80% frozen. This is having a tremendous effect on diving ducks. cool. What an odd duck! They are handsome ducks, very distinguished-looking (for ducks). Yeah, aside from the unusual bill, I really like the white that offsets his eye. I don’t think I ever got such a good look at these birds before.